Hello, I am Godsu, This is my guide to the New Warlock. The reason I started for a luck build is because I love dealing a high amount of damage in one go rather than DPS, making luck build highly valuable when it has come to this point. My stats show that can survive for nice amount of time, I went full attack due to the previous sentence. Stamina gives me large amounts of health and mana, which is key to living. I only have 1 defense seal total. 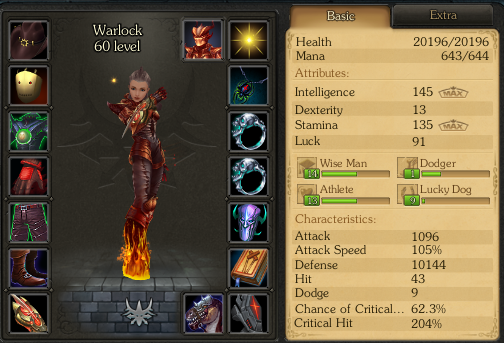 i do plan to change in the future but right now I prefer 20k hp with my current gear. 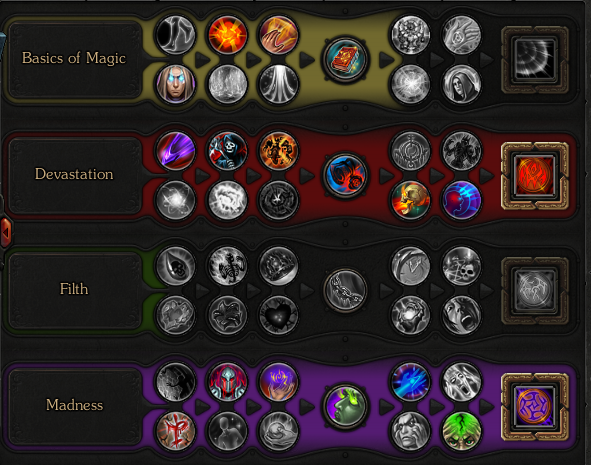 I choose these talents the first day Mage patch rolled in, I stuck with them ever since because they suit me well. 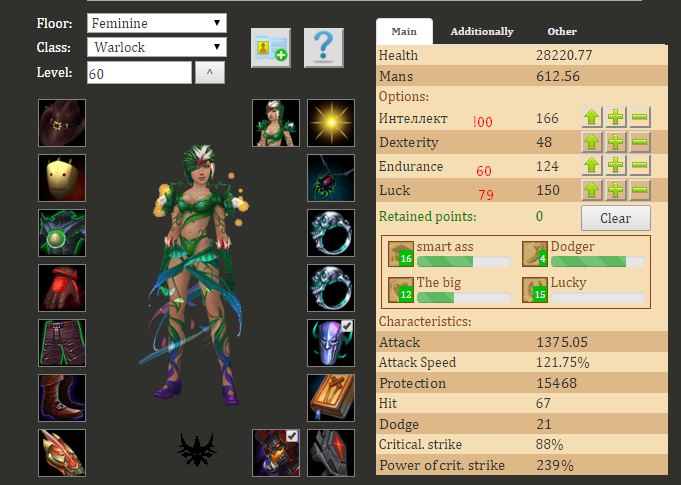 Mind you these can be said as PvP talents with Luck build, leading to mana problems and PvE problems or when leveling. 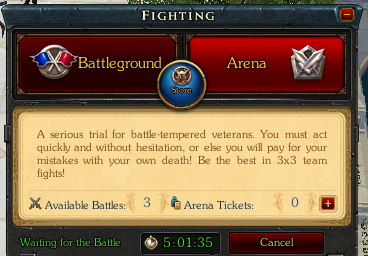 I will classify these as a end game PvP talents and not for PvE/leveling. Devastation - This tree lets me implement scythe abilities with extra benefit from using such ability at the correct times, and I receive everything that affects my build directly. Filth - Although not a terrible tree, It didn't suit my decision on what kind of build I wanted to go. Madness - Lastly, This tree allows me to get defensive or apply the glorious defense debuff, the end talent gives 2.5 seconds of immunity along with a fear, and we all know that is very good against melee characters. Farming - I found it easiest to farm in the towers, though it was old warlock and I had friends with me along the way. It isn't hard nor easy to farm, hard grind and quests will get you 60 in no time. Most farming spots consist of mobs that can be easily gathered up and AoE'd down. 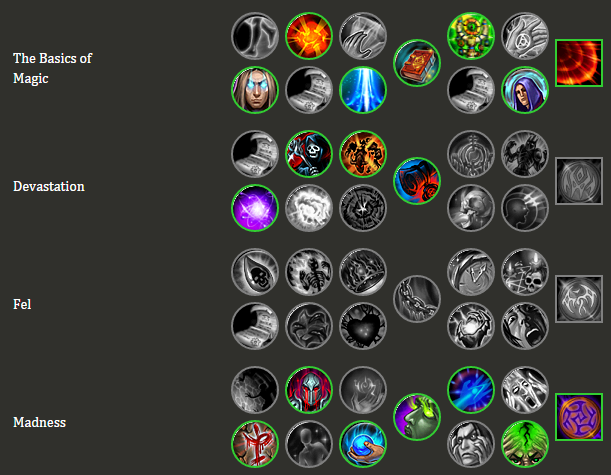 These talents allow you survive and have sustainable mana while farming. I didn't have this due to being the old warlock but now I don't see many problems with how farming can be "impossible". Though I didn't go fully in depth, they should be self explanatory when you read them and think. Though used from Russian calculator. It is an accurate description of what I want with gear and boss cards alike. Hopefully I can reach this point one day. Any questions, comments or concerns. Post here, PM me on forums, or mail me ingame. Edited by Godsu (Elgore), 11 January 2016 - 10:16 PM. Someday young, Padawan i like the farming talent, can i ask what tree i have to choose first for farming? Tree you would want first is basics due to the mana regen and slight shield.